About two weeks ago, Noah's school had a "Daddy Day". Noah took Chris into school with him on a Saturday morning for 45 minutes. The kids were able to show their dads around the classroom and what they enjoy doing at school. Of course Noah showed Chris the dinosaurs. Apparently Noah carries this brontosaurus around EVERYWHERE... he even sits next to him during craft time :) The boys got some nice one on one time while I got to have a long and peaceful shower! Recently, I shared how I'm a stickler for a made bed. While I love a made bed, I might make it slightly different than other people do. I always fold the top sheet and comforter down, making it easy to get in and out of it when sleeping. I also like the printed sheets to show to add some extra color. I was thrilled when a good friend of mine told me she has started making and selling these name pillows (among other things) at ParkPlaceGallery on Etsy. She asked the the colors in Noah's bedding and made these gray (with navy backing) NOAH pillows. I really love how they look on his bed! You should totally check out her website... next up I want the Ninja Turtle cardboard letters! After going away on a tropical vacation, it was a little bit of a let down to come back to chilly and rainy weather (especially when it was in the 70s in NJ when we were away!). Thankfully, we got another taste of Spring when it hit 60 degrees this week. We took advantage of it and went for a walk to our neighborhood playground. Noah got to ride his Ninja Turtle trike and I got to check out the new buds. I'm excited that the flowers in our front yard are starting to poke out, but I have serious flower envy with my neighbors fully bloomed daffodils. I think I may have to go talk to her and find out how she does it! And finally, I'm very excited to announce that I will be co-hosting an Easter Basket link up with some of my amazing blogging friends! I've been having so much fun picking things up here and there to put in Noah's Easter basket and I can't wait to share the finished product with you. The link up will go live on Wednesday, March 23rd, and stay open for a whole week. 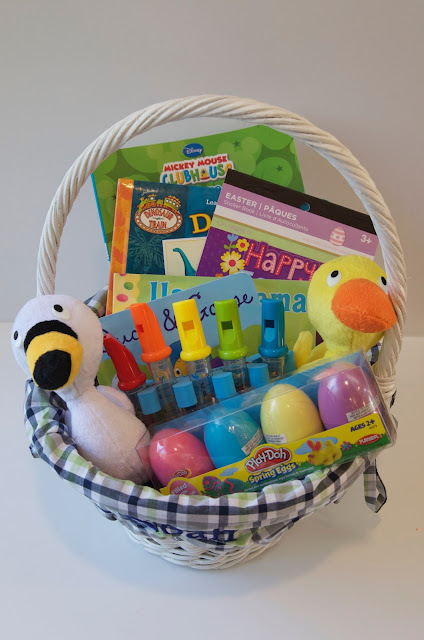 We'd love it if you'd grab the button below and link up a post sharing all the goodies the Easter Bunny is bringing your kids this year :) And if you prefer to share your Easter basket on social media, add the hashtag #easterbasket2016 so we can follow along. If you are still looking for ideas, here's Noah's basket from last year (when he was 2) and 2014. 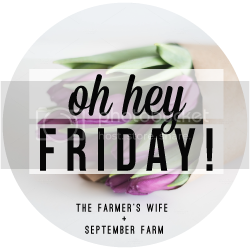 Today, I'm linking up with The Farmer's Wife and September Farm for "Oh Hey Friday" and with A. Liz Adventures for "Five on Friday"! coming back from vacation is always bittersweet. nice to be back home and to normal routine - i always feel like i need a couple days to rest after my vacation though! haha Love the name pillows !! so cute! I always love going on big grocery runs like that, I feel so healthy! I'm so ready for spring - will it hurry up already!?! I love that Noah's school did the bring your Dad to school on a weekend! I bet a lot of Dad's work and wouldn't otherwise be able to come and so it's so special that Chris was able to go with him that day! Cut veggies and fruit are such great snacks! I want some sliced cucumbers now lol. That Noah pillow is adorable!!! And you totally go above and beyond, I cant even with flat sheets. 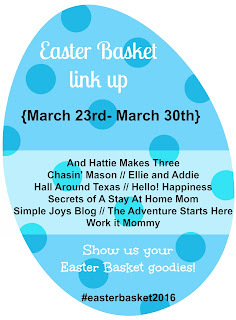 Yay for the Easter basket link up! Those pillow are amazing! I totally want them for my house! I'm sure Noah had a great time on his vacation despite saying otherwise haha! You live in NJ? I'm from NJ! We live in Kansas City now though! I am also a sucker for a made bed. We have a rule in our house that once you turn 5 you have to start making your own bed. It is fantastic that everyone's beds are always made now. Hope you are having a great weekend. Next time you can take me to Turks and Caicos.  Noah can stay back and hang out with Mason! Haha. Only kidding. But, I understand. Mason does so much better when he’s on a routine. The Daddy day at school sounds precious! I bet Noah was excited to show him around. I make a bed the same way you do for the same reasons. His Noah pillows are awesome. Can’t wait for the Easter basket linkup!